“Richard Trench, archbishop of Dublin, once was reportedly confronted by a skeptic who questioned the prelate’s testimonies of answered prayer. ‘Your answers to prayer are nothing but coincidences,’ scoffed the skeptic. Stir quickly and do not overmix. Knead on a floured surface. You may need to add a little flour to make the dough workable, and not sticky. Roll or pat dough out into a 1″ thickness. Cut with a floured biscuit cutter or drinking glass. Bake on a greased cookie sheet (or baking stone if you have one!) at 450 degrees for 10-12 minutes or until golden brown. We recently sang and played at a Farm Bureau meeting, and they had some little coloring books for the younger girls. Later, when we came home, I was reading through it and found some interesting facts about Indiana 😀 So if you love Indiana, here’s a list of fun facts! -In 1968, James Oliver invented the chilled-steel plow in South Bend. You can see the Oliver Mansion (Copshaholm) in South Bend today, exactly as it was when the family handed the keys over to the Center for History with everything in the drawers and closets and cupboards! -Orville Reddenbacher was born in Indiana, and is named the “Popcorn Czar”, after developing many papcorn varieties. -The world’s largest Children’s Museum is in Indianapolis. -Holiday World (Santa Claus Land) was the world’s first theme park, located in Santa Claus, Indiana. -The world’s first train robbery occurred in Seymour in October 1866. -The first submarine was launched in Michigan City in 1847. -Indiana is usually the number one duck producer in the United States. We raise approximately 9 million ducks annually. -Indiana is in the top five states in the U.S. in chicken and egg production. There are 50 million chickens on Indiana farms, and 5.5 billion eggs were produced by 21 million laying hens! -Indiana is one of the top mint producers in the nation. Mint growing in Indiana dates back to the 1900’s. -Indiana is always the number one popcorn producer in the U.S. producing 255 million pounds a year. American popcorn travels all over the world. 17.3 billion quarts of popcorn are popped annually, or enough for 68 quarts per person! A couple of nights ago, while we were down in the basement waiting out a tornado, the Littles were asking questions about tornadoes. Aww what a sweet kitty. 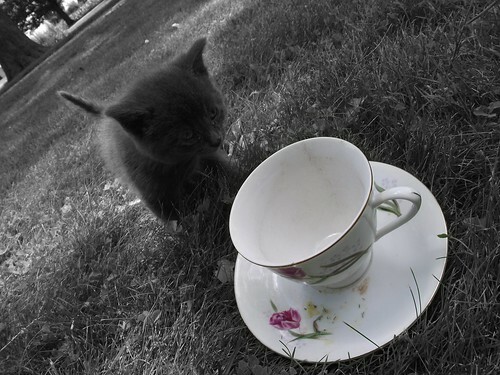 What is it doing with the tea cup? ohhhh, i found a new favorite [or close to] favorite movie, 102 dalmations. have u seen it? Oh come now…he had personality, and that’s what matters, right?! 😀 Hee, hee! Thank you! Do I get an A+?! 😀 Is it the people version or the cartoon version? I *think*we’ve seen both, but it’s been a while! I also live in Indiana. I am in the “City of Firsts.” Norman Bridwell, author of Clifford the Big Red Dog, was born in my city. Ryan White, who died of AIDS many years ago, used to live in my city. The Underground Railroad went through my county. When I was working with dd on studying Indiana, she made 2 huge scrapbooks — one for Indiana, and another just for our city/county. We uncovered all kinds of interesting information.